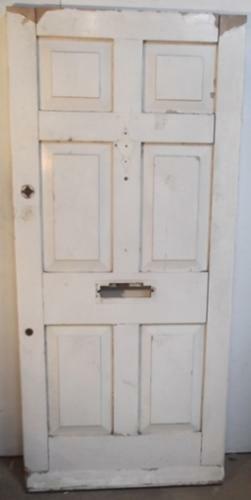 de0361 An Original Heavy Victorian 6 Panelled Front Door. Fully morticed and tenoned this solid door has 6 fielded panels to the external face. In good condition for its age but needs some TLC such as the joints need old paint and filler cleaning out before re-joining. Also the surface needs stripping or sanding down before finishing. Please contact us for a quote if you would like us to do this.